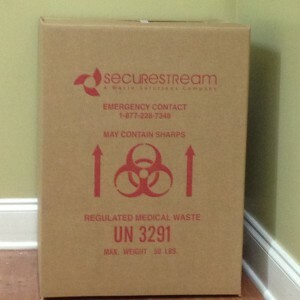 Secure Stream specializes in the safe, compliant, and reliable disposal of commercial medical waste. We service a variety of customers including hospitals, medical offices, veterinary clinics, nursing homes, labs, dialysis centers, tattoo parlors, home health agencies, funeral homes and all other industries that produce biohazard waste. Regardless of the size of your facility, we can work with you to individualize a program to meet your specific facility’s medical waste needs. 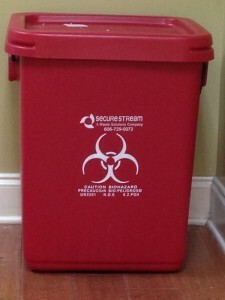 Complete chain of custody documentation for the collection and treatment of biohazard waste, which includes step-by-step tracking of your waste and required shipping manifestsWhy Secure Stream? Affordable Pricing – Secure Stream can save you as much as 25-50% off of your current disposal costs. No Hidden Fees– Unlike the national haulers, there are never any additional fuel or service charges for our services. Flexible Schedules– Our experienced staff will work with you to determine a pickup schedule to best fit your specific facility’s needs, not ours. Superior Customer Service– Don’t just take our word for it! We will be glad to provide you with numerous references throughout the state who have switched to us and are glad to share with you their satisfaction with our service. Compliant Disposal- Secure Stream is fully compliant with both state and federal laws governing proper transport and disposal of biohazardous waste. Multi-Service Vendor– Bundle multiple services such as document destruction or commercial waste services for even more savings! Best of all we are not simply a waste broker from out of state! When you hire us to provide a service, it is truly us who will be servicing your account. We are a Kentucky owned and operated business proudly serving the bluegrass state!